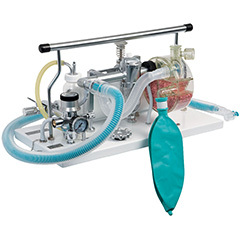 MK5 is a small animal closed circuit anaesthetic machine that is lightweight for easy carry into field. It features low operational costs and minimal/absent pollution. The MK5 with two in circuit vaporisers (AN-7570-00) enables the choice of 2 of the 4 most commonly used volatile anaesthetic agents (Isoflurane, Enflurane, Sevoflurane or Halothane). Combined pressure reducing regulator and flowmeter. Provides accurately metered oxygen flows between 0.1-3L/min and incorporates an Oxygen Flush (Bypass) control which operates at all settings to rapidly inflate the breathing bag when required. KAB™ CO2 Absorber with integrated APL valve (Autoclavable). Lightweight, portable with powder coated white stainless steel base with steel subplate. Easy to access controls, can be viewed whilst operating. Self Seal Outlet (1 included).